‘Who is Scarlxrd?’ you’re probably asking yourself. And until a few weeks ago, we were asking ourselves the same thing. Seemingly from out of nowhere, this masked menace has erupted out of the underground and is playing sold-out shows across the UK and Europe, with festival slots booked in throughout the summer. Having built his fanbase online to the tune of 1m YouTube subscribers and 750,000 monthly Spotify listeners, we thought it was about time to talk to the man formerly known as super-smiley YouTuber Mazzi Maz. Judging by image alone, you’d assume Scarlxrd (pronounced Scarlord) wasn’t playing anything approaching metal, but you’d be wrong. His music is a hyper-aggressive meld of piercing shrieks and distorted guitars with heavy trap beats and hip-hop-esque vocals. So what is it? And who is Scarlxrd? And what happened to his former YouTube persona? We had to talk to the man himself to find out. Hey Scarlxrd! You used to be in a nu-metal band called Myth City! Do you prefer it as a solo performer? Where did your visual aesthetic come from? Do you take a lot of inspiration from Japanese culture? What do you say to people who saw you as your former self as a happy-go-lucky YouTuber and think Scarlxrd is all an act? “That’s the beautiful thing about it, you pick what you decide to see. It’s all perception based. If you were to follow me from when I started YouTube to this moment now, and you saw every single day and every single thing I went through, then you’ll totally understand. You said you hate people, is that something you stand by? Is your music a reflection of this societal view that there are too many people? “For sure, but I’m delivering my perspective when I make the music. If I’m really really upset at the time I make a song, then that’s what you’ll get out of it. If I feel like I want to say something about the current state of something, then that’s what you’re going to get. The music is very honest. It feels like you’re actually in quite a good place right now. You’ve got a strong following, a burgeoning career… but there are still aspects about life that are largely negative to you. “I always count my blessings in life. I’m very grateful for the position I’m in and for the fans, but just because life is going extremely positively doesn’t mean I’m going to change. I don’t even think my music is negative, it’s all perspective-driven, it’s up to you, the listener, to pick what you hear, pick the message and pick how you feel. 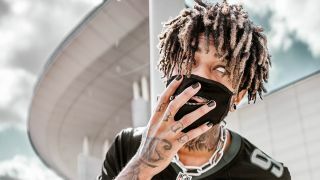 What are your ambitions for Scarlxrd? Scarlxrd's latest album DXXM is out now.